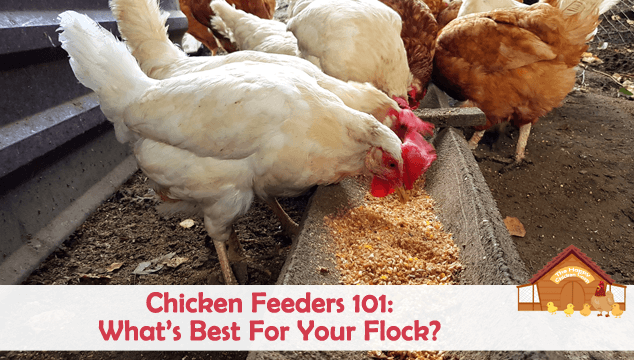 Chicken Feeders 101: What’s Best for Your Flock? You are here: Home / Managing Your Flock / Chicken Feeders 101: What’s Best for Your Flock? Chickens aren’t fussy when it comes to feeding time. They really couldn’t care less if you dumped their food on the ground, they would still eat and make a lot of mess while doing it! We supply our flock with feeders so that waste can be minimized, food is kept clean and fresh and we can monitor how much they eat. It also keeps the area cleaner and so discourages mice and rats from setting up camp in or near your coops. Rats especially carry diseases that can be transmitted to your flock and so they should be actively discouraged. 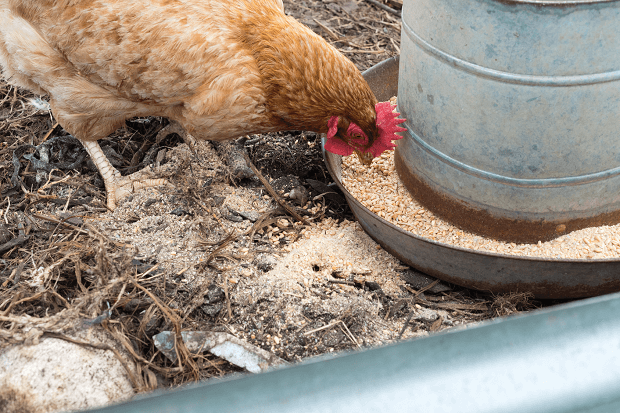 In this article we are going to look at what your chickens need from a feeder, what makes the perfect feeder and finally, share with you some of our favorite feeders. The makers of poultry feeders have addressed most of the wish list items quite successfully I think. Some feeders are easier than others to set-up but in general they are all quite straightforward. The lip helps to prevent waste and mess in the coop. Try to ensure that it is easy to take apart for periodic cleaning, along with this is it easy to refill? Another thing to think about is how many hens can access the feeder at the same time? If they can all feed happily at the same time so much the better. Pest proof feeders are few and far between, but they do exist, we will talk about them later on. Lastly, if you use a range feeder, is it waterproof? Wet feed is unappetizing and can easily grow mold. With all of these things in mind, let’s now take a look at the materials used in chicken feeders and then a look at the feeders themselves. Materials generally fall into two categories: metal or plastic. Interestingly metal is becoming harder to find, however, in my experience, they far outlast their plastic counterparts. Plastic is becoming more common because it is cheap to mass produce; a great bonus for manufacturers. It’s also easy to clean and maintain. It is quite durable and will last a long time, but even plastic will ‘dry rot’ eventually. Harsh winters are hard on plastic feeders. The plastic becomes brittle and will break or crack. Sun too, can have a detrimental effect – the coloring of the plastic will bleach out and very strong sunlight can cause feeders to crack eventually too. However, both types will see you through a couple of years at least before you have to replace them. There are such things as ‘treadle’ feeders which work a bit differently. The hen has to learn to stand on the platform to open the box. When she opens the box the feed is inside the container. Hens quickly learn how to operate this type of feeder and ‘self-feed’. The beauty of this feeder is that it is effective at keeping out small vermin such as rats and mice and the feeders are usually waterproof. Raccoons however, are very smart and can quickly learn how to access the food, so this type of feeder should not be left where it can be accessed by other animals unless you have a locking device on it. Almost all feeders work on the gravity principle – you take from the bottom and it is replaced by feed trickling down from above. This is a simple but effective solution. These feeders are by far the best sellers, whether they are hanging, wall or corner mounted. As we mentioned earlier the hanging type of feeder can cause congestion in the coop unless you have a large coop area. Since they are relatively inexpensive, it’s not prohibitive to have a couple of feeders so that all birds can access the feed. Sometimes a bully hen will guard a feeder believing it is her property. She will chase off the hens lower in the pecking order, so a second feeder will ensure that all birds have access to food. These types are inexpensive and easy to set-up either inside or outside the coop. Many come with ‘rain guards’ to prevent food from getting wet should it rain. Trough style feeders remain popular, especially for small chicks. One of the best things about the trough style is that lots of hens can fit around the feeder all at the same time. You should make sure the trough you buy comes with legs. 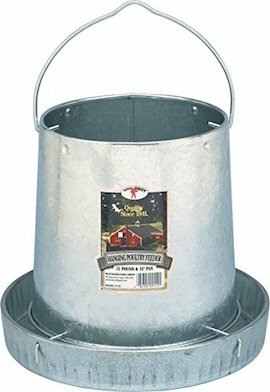 This keeps the feeder above the ground and prevents mud from mixing into the feed. Another advantage of this type of feeder is that chickens tend not to sit on the trough; whereas with other types of feeders they can be known for sitting (and pooping) in/on them! As small flock keepers we can get our feeders from the local farm store or similar, but if you have a lot of hens you may need to look at the commercial manufacturers range of goods. Recently newer manufacturers have been breaking into the market with newer designs, so our flock can be spoiled for choice in feeders! One of the more interesting ‘newer’ designs is the pest proof style. 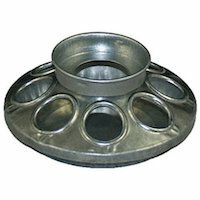 If you’re having a problem with pests or just want to keep their feed fresh, I would recommend you try this style of feeder. These are smaller versions of the adult sized feeders. In general, chick feeders are either troughs or round bases to fit Mason jars. Chicks will soon outgrow the small feeders so don’t spend a fortune on them. Within a few weeks you can change them up to adult sized feeders set on the ground for accessibility. How Many Chicken Feeders Does Your Flock Need? How much storage capacity do you need? If you have 6 hens they will eat roughly ¼lb of feed per day. This equates to a total of 1½lb each day for the flock. So at a minimum you need a feeder that will hold that amount, but since you are unlikely to clean the feeder daily, a larger capacity feeder will save you work. Firstly, it will take a while for them to eat their way through 50lb – during which time it may become damp and potentially moldy. Secondly, if you leave the feeder outside of the coop, unless you pick it up and stash it securely each night (it will be heavy! ), you are going to have some of the fattest rats and raccoons around! Something we don’t think about often is how much space does your feeder use? The standard hanging feeder actually uses a great deal of room when you think about it. Once the hens are crowded around it there is little free room left. So there you have it! 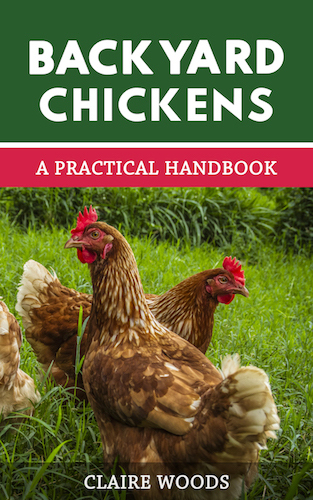 All the information you need to make an informed decision about what type of feeder to get for your chooks. We have covered the important points of what to look for in the ‘ideal’ feeder and the advantages and disadvantages of the different types. 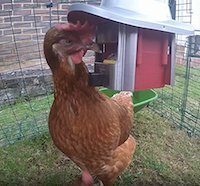 Whether you have 6 chickens or 60, there is a feeder out there for you – if not, make your own! 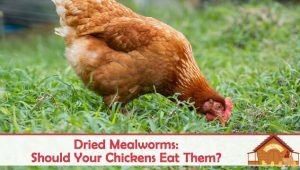 Dried Mealworms: Should Your Chickens Eat Them? I have 3 hens and a small cool hung metal rabbit feeder on coop wall with eye screws so it can be cleaned. Works really well! I have 2 different types for feeders. Two hangers and a trough. The largest hanger I place egg maker and the smaller I put oyster shells on opposites side of the coop. I have two outside feeders, home made wooden troughs. I feed my 19 chickens rolled oats twice a day and they have a constant supply of egg maker inside the coop. 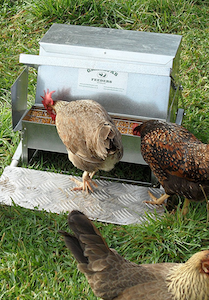 We have a galvinized hanging feeder big enough for all the hens to feed at one time – 6 hens. The plastic feeder kept falling apart – the screw gave way every few days. Love the new feeder. We take it in every night.. great information – love this site!